CK Kerley brings pizzazz to IoT marketing! I’ve been away, really celebrating the holidays with my family and working on revisions to my e-book on managing the IoT for mainstream companies. What better way to return than with a new publication that really gives some oomph to marketing the IoT? 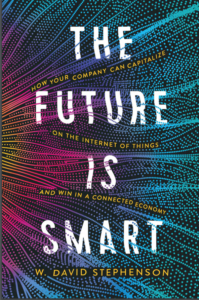 I met CK Kerley when she made some nice comments about my SmartStuff e-book intro to the IoT, and have been impressed by the energy and pizzazz that she brings to the marketing aspect of the IoT — elegant tech can only take you so far, and then you need to sell the stuff! Now CK has a free e-book on marketing the IoT, The Smart Revolution, and it’s a great jumping off point for planning your own IoT marketing strategy. You can quickly finish it one one sitting — then come back to it again and again for future inspiration. What comes through time and time again throughout the brief tome is something I hope also comes through in this blog and in my forthcoming e-book: the IoT won’t just make current things (literally and figuratively) better: if we fully exploit its potential, it will result in fundamental transformation! “The benefits of smart capabilities will have profound implications upon tomorrow’s customers who will be much more demanding, much more impatient, and much more savvy, with much higher standards. “Now marketers can move from developing individual dumb products for customers to engineering fuller, smart solutions that truly change customers’ lives. You are enabled to remove the mystery that has shrouded entire areas of your audiences’ lives and infuse it with transparency—empowering them to make better decisions that lead to better outcomes. “Marketers can eliminate the overwhelming complexity that has plagued their customers’ lives and, through their smart brands, replace it with sheer simplicity. And you can expand the roles your brands play in customers’ activities—a move that your markets will welcome because it will transform static components into dynamic experiences for them. She’s taken the tack of organizing IoT marketing in terms of 5 basic principles, with several brand examples for each to show that the IoT is a current reality, not a laboratory dream. Think of those examples as ammunition to convince skeptical executives that the IoT is a reality and the time to develop a strategy is now! Jawbone UP: My fav Xmas present? Other than the totally-outside-the-box, totally-unexpected MacBook Pro, I love my new Jawbone UP, and the ability it gives me to track my fitness activities! GlowCaps Smart Pill Bottles: “Removing the complexity of remembering to take medication by turning the simple pill bottle into a smart reminder.” Still one of my fav IoT pioneers! IntelligentM SmartBand: “replacing the complexity of hand-hygiene compliance by turning healthcare workers’ wristbands into personal, real-time reminders.” This is my fav of Kerley’s examples: one of of my cousins got very, very sick at America’s finest hospital (it may or may not be in Baltimore…) from a Hospital-Acquired Infection — which usually occur because personnel forget to wash their hands! “Through RFID technology, the SmartBand works by communicating with other objects (such as IV bags) that reminds workers to sanitize their hands by buzzing three times. Then, once workers have thoroughly washed all areas of their hands for the correct amount of time, the wristband buzzes once, signaling workers that they can proceed with their treatments.” How cool is that??? Vail Resorts Smart Ski Pass: “turning the dumb ski pass into a dynamic device unleashes an entirely new skiing experience.” I got a little preview of this transformation skiing in the Berkshires last year: the lift ticket was a glorified RFID tag. However, this goes far beyond!”When visitors get to each lift, their tickets—enabled with RFID technology—are scanned and automatically record each skier’s lift rides, calculate their vertical skiing feet and tally their ski days.”To review progress, users simply need to access the online site or mobile app replete with stats, maps and achievements that tell the story of the customers’ “epic” days or “epic” seasons—with Vail featuring a separate kids’ site for children under 13. The site, app and smart ski ticket do more than just record data, they award skiers with special pins commemorating hundreds of milestones, special adventures and unique accomplishments for each day—and each season—at each of Vail’s collection of ski resorts.” Neat! GolfSense Smart Golf Sensor: “a smart globe becomes a new virtual participant — and a golfer’s secret weapon — in the game experience.” OK, this one hurts: for a short while this Fall, before I did a competitive products search, I thought I had the KILLER IoT golfing app. Alas, while it did have some unique elements, this and some other apps do a good enough job that there was no reason to develop mine. Fame and fortune remain around the bend (or on the next tee). So check it out, and, if you’re a corporate marketer, add your voice to our chorus to get your C-level execs fired up about the IoT’s revolutionary potential. Thanks, CK!